They are, perhaps, the most dreaded four words in the English language. 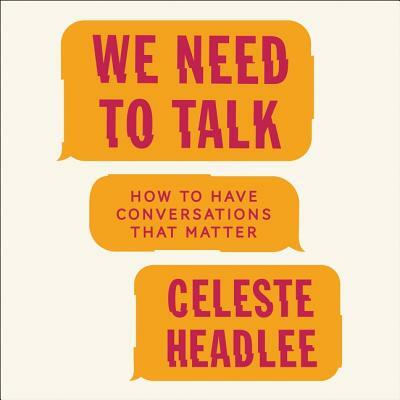 But in her timely, insightful, and wonderfully practical audiobook, We Need to Talk, Celeste Headlee--who earns a living by talking on the airwaves of National Public Radio--makes the case that they are urgently needed. BE THERE OR GO ELSEWHERE. Human beings are incapable of multitasking, and this is especially true of tasks that involve language. Think you can type up a few emails while on a business call, or hold a conversation with your child while texting your spouse? Think again.CHECK YOUR BIAS. The belief that your intelligence protects you from erroneous assumptions can end up making you more vulnerable to them. We all have blind spots that affect the way we view others. Check your bias before you judge someone else.HIDE YOUR PHONE. Don't just put down your phone, put it away. New research suggests that the mere presence of a cell phone can negatively impact the quality of a conversation.